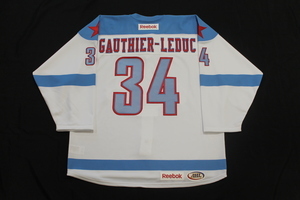 NHL Auctions and the Buffalo Sabres are currently auctioning off game issued Rochester Americans jerseys. Jerseys issued to the Rochester Americans for Men's Health Night on January 31, 2014 presented by UAR. Proceeds to benefit Lipson Cancer Center and ZeroCancer.org. 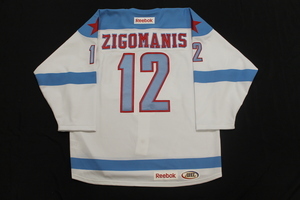 Jerseys available from Jonathan Parker, Mike Zigomanis, Phil Varone and more!! NHL Auctions and the Buffalo Sabres are giving you the chance to bid on Sabres tickets!! Choose from games against the Blackhawks, Rangers, Devils, Canadiens and more!! Proceeds benefit the Buffalo Sabres Foundation!! NHL Auctions and the Buffalo Sabres are giving you the chance to bid on jerseys worn during the 2008-09 season!! Choose from jerseys worn by Patrick Kaleta, Jason Pominville, Maxim Afinogenov, Ryan Miller and more!! Proceeds benefit the Buffalo Sabres Foundation. Go to a Buffalo Sabres Game!! NHL Auctions and the Buffalo Sabres are giving you the chance to bid on tickets to Buffalo Sabres games!! Choose from games against the Calgary Flames, Florida Panthers, Boston Bruins and the Carolina Hurricanes. Buffalo Sabres Game-Worn Jerseys & Goalie Equipment!! NHL Auctions and the Buffalo Sabres are giving you the chance to bid on game-used Sabres jerseys and goalie equipment!! Choose from jerseys worn by Nathan Gerbe, Craig Rivet, Tim Connolly, Derek Roy and more!! Choose from a goalie blocker, pads or glove worn by Ryan Miller!! Choose from games on 10/3 vs. Canadiens, 10/8 vs. Coyotes, 10/13 vs. Red Wings, 10/16 vs. Islanders and more!! Buffalo Sabres Game-Worn Jersey Charity Auctions!! NHL Auctions and the Buffalo Sabres are offering you the chance to bid on game-worn home and away Buffalo Sabres jerseys!! Choose from jerseys worn by Derek Roy, Toni Lydman, Patrick Lalime and more!! NHL Auctions and the Buffalo Sabres have teamed up to offer you the chance to bid on game-used Buffalo Sabres jerseys!! Proceeds benefit the Buffalo Sabres Foundation!! Choose from Thomas Vanek game-used All-Star Jersey, Ales Kotalik game-used third jersey, Ryan Miller game-used jersey and more!! NHL Auctions and the Buffalo Sabres are offering you the chance to bid on game-worn home and away Buffalo Sabres jerseys. Choose from Ales Kotalik, Tim Connnolly, Thomas Vanek, Ryan Miller, Craig Rivet, and more!! Proceeds benefit charity, BID NOW!! !